California Hydrogen Fueling Station Sign with Pump Pictogram - 18x18 - Reflective Rust-Free Heavy Gauge Aluminum Alternative Fuel Signs with Anti-weather and Anti-graffiti Protection Available. The California Energy Commission has a goal of constructing at least 100 hydrogen stations across the state by 2020. With approximately 3,000 Fuel Cell Electric Vehicles driving on California's roadways, the demand for appropriate hydrogen fueling signage has steadily increased to try and help guide motorists to nearby fuel stations. STOP Signs and More has taken the initiative to develop Hydrogen Alternative Fuel Signage to help alleviate the frustration motorists feel when needing to locate a nearby Hydrogen Fuel Station. DOUBLE the working life of your Alternative Fueling Signs by adding 3M Protective Overlay Film (POF)! 3M’s high-tech POF protects sign faces against fading caused by the sun and harsh weather—and makes graffiti and sticker defacement damage easy to clear away without harsh abrasives. Industry experts and consumer feedback has suggested that the currently existing "HYD" Hydrogen Signage is not the most clear identifier for Hydrogen Fuel. Professionals agree that the natural progression and implementation of alternate hydrogen fuel signage needs a more refined and legible symbol that can be understood worldwide. Automakers, station developers, and consumers more typically identify hydrogen fuel as "H2", which is a reference to the chemical composition of hydrogen as denoted in he periodic table. 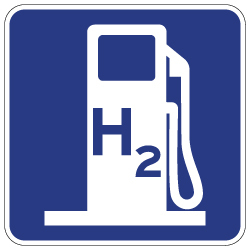 The symbol "H2" is accepted worldwide as a clear indicator for Hydrogen and soon will be used for the majority of alternative hydrogen fuel station signs.